If you are the owner of a commercial property, you may be wondering if your property is adequately insured. Your Insurer may use the term ‘Replacement Cost’ and the terms ‘Reinstatement Cost’ or ‘Reconstruction Cost’, may also be listed somewhere on your policy. While the term ‘Replacement’, ‘Reinstatement’, and ‘Reconstruction’ all seem to have the same meaning, in Insurance terms, they will return vastly different values. A Building Reinstatement Cost Estimate calculates the cost of the building for insurance purposes. This will ensure you are not over-insuring your building and paying more for insurance than you need to, but also ensures you have enough insurance to cover your building should a loss occur. Doesn’t the Real Estate Appraisal tell me how much my property is worth? Is this sufficient for insurance purposes? The Real Estate Appraisal tells you how much you could reasonably expect to sell the building and land for at the current market value. This value is not sufficient for insurance purposes because it does not describe the cost you would incur if there was a catastrophic loss and you needed to demolish what was left of the building and rebuild it from scratch. Why is it important to ensure my insurance is being calculated based on Reconstruction Cost? Owners of commercial properties have the most to benefit from ensuring their property is adequately insured because the risk associated with a loss includes not only significant out-of-pocket building costs, but also the loss of income from the property if there is any delay in reinstating it to its current state. When might I need a Reconstruction Cost Estimate? An Insurance company may ask for one in the process of evaluating a property for a new insurance policy or renewing an existing policy. As an Owner, to ensure your property is adequately insured, you should have one done for a new insurance policy or at the time of renewal if you are questioning the value of your property and would like an independent opinion. How do insurance companies calculate the replacement cost? There is no standard method used by insurance companies but most often a construction cost manual such as Marshall & Swift will be referenced for the unit cost per square foot of a similar type of building and multiplied by the area of the subject building. Why is this a flawed way of calculating the replacement cost? Because it is theoretical replacement with a similar type of building and not an actual reconstruction cost evaluation, which includes for all costs associated with reconstructing a building at today’s standards and codes. Other costs are not considered with replacement cost, such as demolition of the existing destroyed building. While replacement cost is merely the cost to replace the building using the same as or far as possible the same material and design as what exists. 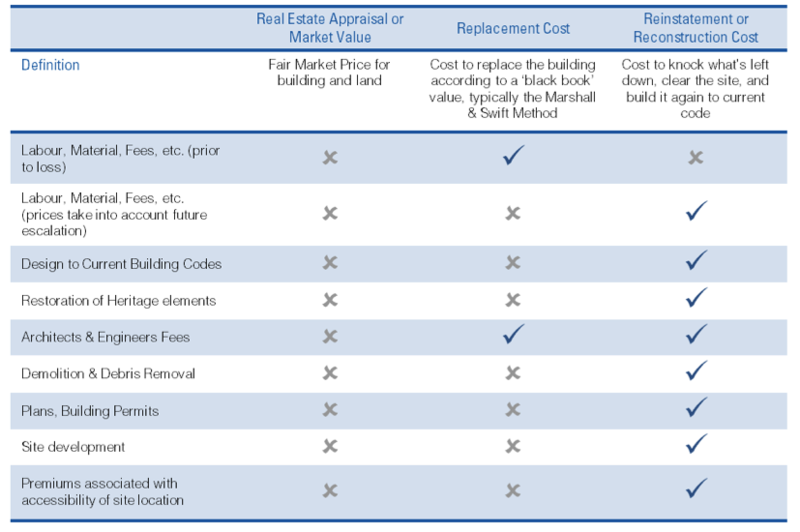 When is a replacement cost appropriate, when is a reconstruction cost appropriate? For many simple or standard types of buildings the replacement cost taken from a cost manual may be appropriate. However if there is any non-typical or unique characteristics to the property it will likely not be appropriate. For any special purpose property or special use property only a detailed reconstruction cost estimate prepared by a Quantity Surveyor will properly account for all the unique characteristics present. In many cases, the replacement cost calculated from the ‘black book’ value will not be enough to cover the costs to rebuild the property. Should a loss occur, the owner would be out of pocket for rebuilding expenses over and above the ‘black book’ value. It is recommended that in all cases, a reconstruction cost estimate be used, particularly when the property is used for commercial purposes. What sort of rebuilding expenses are not taken into consideration from the ‘black book’ value? Demolition and clearance of the site, shoring up of neighbouring buildings, reinstatement of any non-structure components of the site (such as a parking lot, landscaping or below grade services) allowance for the escalation of the cost of labour and materials in the future, permit fees, and any premiums associated with construction for the property’s geographic area. The ‘black book’ value also does not take into consideration that should your property need to be rebuilt, it would have to be built to be compliant with the current building code, which could have a serious impact on the design and materials you must use to rebuild. A Replacement Cost Estimate will only cover the cost to replace the building with one of comparable size, utility and materials. For example, it would not take into account that your new building will require an elevator (where a narrow staircase previously sufficed). What are the other considerations that will be taken into account for a Reconstruction Estimate? Heritage components, current building codes, construction standards, accessibility, building material availability, etc. What documents are required to have a Quantity Surveyor complete a Reconstruction Estimate? A Quantity Surveyor would require scaled drawings of each floor and photos of typical interior and exterior finishes. If this documentation is not available, the Quantity Surveyor can perform a site visit to measure and evaluate the property.